↑ This article adopts 1568 as the starting date of the war, as this was the year of the first battles between armies. However, since there is a long period of unrest leading to this war, it is not easy to give an exact date when the war started. 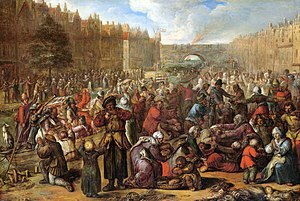 The first open violence that would lead to the war was the 1566 iconoclasm, and sometimes the first Spanish repressions of the riots (i.e. battle of Oosterweel, 1567}}) are considered the starting point. Most accounts cite the 1568 invasions of armies of mercenaries paid by William of Orange as the official start of the war; this article adopts that point of view. Alternatively, the start of the war is sometimes set at the capture of Brielle by the Gueux in 1572.